Great hotels can inspire you, pamper you, and give you a much-deserved break from the humdrum routine of daily life. Europe may have hotels in former palaces, but there are plenty of outstanding hotels and resorts in the U.S. too, and in many ways, they tell the story of this country. Take the Roosevelt Hotel in New Orleans for example—the legendary grand dame dates back to 1893, survived Hurricane Katrina, and is back and better than ever after a major renovation, complete with a restaurant by acclaimed chef John Besh. In picturesque New England, the Chanler at Cliff Walk is set in one of Newport’s grandest mansions built in 1873, when Gilded Age tycoons turned the ocean-front town into a summer playground for Gatsby-esque parties. 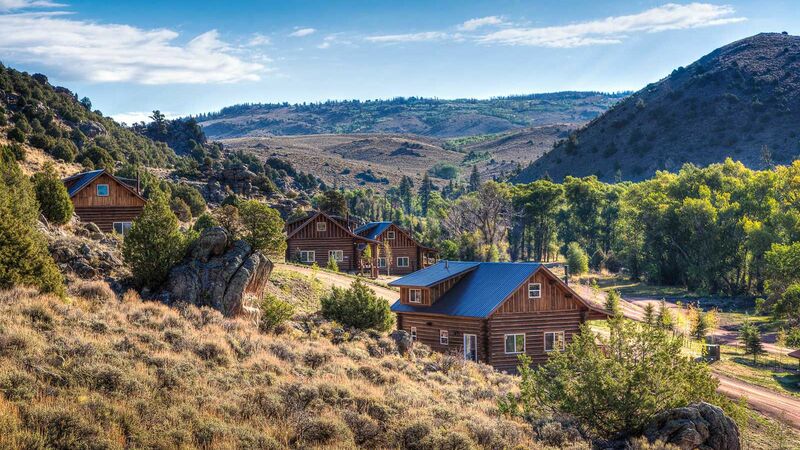 At Triple Creek Ranch in Montana, guests can step back in time to the Wild West, ride horses, hike through the mountains with a guide, and cozy up by the fireplace in a luxury cabin. In Oklahoma, you might be surprised to discover the Mayo Hotel, which in its heyday hosted John F. Kennedy, Lucille Ball, and Babe Ruth. Though it suffered a period of decline in the ‘80s, it’s been reborn and reimagined as a gorgeous hotel for the modern day. More recently, hotels like 21c Museum Hotel Louisville and Cincinnati have revived forlorn downtowns by renovating former factories and filling them with art. These are just some of the fabulous hotels that T+L readers have voted into our hall of fame, known as the World’s Best Awards. Most of the hotels on this list received top scores from readers, who rated everything from the quality of the rooms to the location, service, dining options, nightlife, and value. In the case of a few states that didn’t have any hotels represented on the World’s Best list, we asked for nominations from the people who know best, including the tourism boards in those states. When planning your next American vacation, consider staying at one of these outstanding properties and vote for your favorites in the 2016 World’s Best Awards survey. The Grand Hotel Marriott Resort, Golf Club & Spa offers guests a relaxing break on the Gulf Coast. The 550-acre property overlooking Mobile Bay is steeped in history. Built in 1847, it served as a confederate hospital during the Civil War and a training base during WWII. The hotel, which scored 87.5 in T+L’s World’s Best survey, has grown considerably since then, and today has two golf courses, ten tennis courts, and six restaurants. Steeped in the heart of a glacier-carved valley, Alyeska Resort is the only North American ski resort with both mountain and ocean views. For adventure-seekers, the property is a veritable gold-mine—in fact, the town it’s located in played a large role in the gold rush. It got a score of 86.182, and one T+L reader raved about its “great location with easy access to ski and mountain walks.” After a day on the slopes, guests can relax in the saltwater pool or whirlpool, or indulge in a treatment at the spa. Former president Bill Clinton’s hometown is home to Arkansas’s best hotel. T+L readers voted the Little Rock Marriott the best in the state with a score of 80.909. Readers praised its great downtown location, beautiful rooms, and late night room service. Nestled in California wine country amid Sonoma’s excellent wineries, the Farmhouse Inn offers the personalized attention of a B&B combined with five star amenities. The family-run inn has only 25 rooms, some of which are in early 20th-century cottages with charming courtyards, feather beds, and saunas or steam showers. Don’t miss the Michelin-starred restaurant, which serves farm-to-table cuisine incorporating ingredients from the on-site garden. All these details and more earned the inn a score of 96 in T+L’s World’s Best Awards. A skier’s paradise, the Little Nell boasts Aspen’s best address. The ski-in/ski-out resort offers the utmost in luxurious digs, which earned it a score of 94.667 in T+L’s Worlds Best survey. Spacious rooms have heated marble floors, fireplaces, soaking tubs, and plush goose-down linens. The pet-friendly hotel even has comfy dog beds and in-room pet menus. The Element 47 lounge is perfect for a meal or après-ski cocktail. With a score of 83.250, Mohegan Sun snagged the title of Connecticut’s best hotel, and if you’re looking for the kind of resort with so many dining options and activities that you never have to leave the grounds, this place is right for you. Famed for its casino, the ginormous resort has 1,200 rooms, 42 dining options (ranging from Starbucks and Krispy Kreme to Todd English’s Tuscany), a 22,000-square-foot spa, and golf club. Delaware hotels weren’t represented on the World’s Best list, but between Wilmington and the coast, the state has several great properties. The Hotel du Pont in downtown Wilmington is the best of them, with a rich history, luxurious accommodations, and an opulent restaurant serving classic dishes like foie gras, lobster bisque, and filet au poivre. With a score of 93.333, the Hay-Adams placed second on T+L’s list of World’s Best Hotels in the continental U.S. The elegant, five-star hotel sits just across from the White House and boasts rooms with views of some of the city’s most famous landmarks, which guests can be transported to via luxury sedan service. If you go, be sure to have a drink at the hotel’s Off the Record bar. Florida has no shortage of hotels and resorts, but the Sunset Key Cottages tops them all with a score of 96. It’s no surprise—the resort occupies its own private island off of Key West. Luxury cottages range from one to four bedrooms with a breezy, beachy aesthetic, some of which have wraparound porches and oceanfront views. A spa, pool, and private white-sand beach make for lazy days relaxing, swimming, and enjoying the scenery. Located on Georgia’s southern coast, the Cloister at Sea Island has long been a relaxing retreat. The 1928 hotel channels the glamor of a Mediterranean mansion both inside and out, with Turkish rugs, wood-beamed ceilings, and landscaped gardens. The Georgian Room restaurant is considered one of the best restaurants in the state and the property received a score of 94.489 in our World’s Best Awards. A recent expansion added a pool overlooking Black Banks River and will introduce 63 new rooms in 2016. Though Idaho didn’t have any hotels on the World’s Best list, Sun Valley is the clear winner. The 80-year-old lodge underwent a massive renovation, which added 94 new rooms, a 20,000-square-foot spa, a fitness center, yoga studio, a glass-enclosed outdoor pool, and redesigned restaurants, lounges, and lobbies. Guests have access to a veritable smorgasbord of dining options. The resort has what you need to keep the entire family entertained, with activities including skiing, skating, horseback riding, tennis, golf, fly-fishing, and sport shooting. Chicago has plenty of excellent hotels, including several standout properties that opened this year, but the Four Seasons Hotel Chicago tops them all with a score of 92.143. The elegant hotel just steps from the Magnificent Mile welcomes guests into a marble lobby with crystal chandeliers. Rooms have colorful artwork, fantastic views of Lake Michigan or the downtown skyline, and bathrooms stocked with Malin +Goetz products. The restaurant Allium serves regional farm-to-table dishes and you can even order homemade ice cream sundaes right up to your room. A former Jesuit seminary, the West Baden Springs Hotel is an architectural marvel in the middle of rural Indiana. The National Historic Landmark’s defining feature is a grand domed atrium spanning 200 feet. Rooms have Egyptian-cotton sheets and artwork created from vintage postcards. A complimentary shuttle will transport guests to the golf course and casino. The property scored 85.263 in T+L’s Worlds Best survey. Iowa didn’t have any hotels represented in the World’s Best Awards, but the Iowa Tourism Office nominated Hotel Blackhawk as the state’s best. The historic property was built in 1915 and received a $46 million renovation courtesy of Marriott—it’s part of the brand’s prestigious Autograph Collection. Paintings by local artists hang in the rooms and suites. Amenities include a restaurant, bar, pool, spa, and bowling alley. Though it didn’t appear on T+L’s World’s Best List, the Kansas Tourism Office recommended the Ambassador Wichita, an Autograph Collection Hotel. The property sets itself apart with 117 luxurious rooms and all the modern conveniences sophisticated travelers expect, including free Wi-Fi and iPod docks. The hotel is home to the Siena Tuscan Steakhouse and offers guests complimentary car service to and from the airport and destinations within a five-mile radius. It’s no wonder this grand dame was featured on our World’s Best list with a score of 88. The Roosevelt Hotel has been operating since 1893, and received a major renovation post-Katrina in 2009, which restored the property to its former grandeur. The luxurious lobby features 1920s mosaic-tiled floors, huge crystal chandeliers, and potted palms. In addition to the plush rooms and suites, the hotel boasts a Guerlain spa and the fabulous restaurant Domenica, helmed by acclaimed chef Alon Shaya in partnership with chef John Besh. Situated along Maine’s iconic coast equidistance from Portland and Bar Harbor, the Camden Harbour Inn is one of Maine’s few truly design-focused properties. The elegant 1864 building received a thoroughly modern makeover, complete with graphic wallpaper, Asian antiques, Art Deco accents, and silk comforters. Even the doors to the restaurant were made using century-old convent doors from France. Guests can expect gracious service at this Relais & Châteaux property. The concierge can arrange anything from hikes with a private guide to cooking classes or a tour in the ocean with a lobsterman. The hotel scored 91.733 on our World’s Best survey. Relaxation and recreation are the focal points at the Hyatt Regency Chesapeake Bay Golf Resort, Spa & Marina. Perched on the banks of the Choptank River, the resort has a renowned golf course, tennis courts, a volleyball court, and access to the marina, where guests can dock their boats. Five restaurants and a self-serve general store offer plenty of culinary choices, including Eastern Shore specials like smoked oysters and Maryland crab cakes. The resort scored 86.933 in our World’s Best survey and was featured as one of America’s best family hotels. Generations of families have summered at the Grand Hotel, Mackinac Island on the shores of Lake Huron, which scored 89.280 in our World’s Best survey. The 1887 hotel is known for its rich history—Mark Twain lectured in the casino—and the simple pleasures it offers, like lawn games and after-dinner dancing. One T+L reader called it “a step back in time to an era when quiet elegance was celebrated.” Indeed, there are no cars on the island, only horse-drawn carriages. Midwestern politeness is just one part of the Saint Paul Hotel’s charm. Doormen in top hats greet guests at this historic luxury hotel in the Twin Cities, where chandeliers and a fireplace in the lobby create a classic ambiance. The building dates back to 1910 and was designed by Reed and Stem, the architects behind New York City’s Grand Central Terminal. One T+L reader noted, “This is a grand dame of a hotel with creative programming and excellent food.” It scored 88.267 in the World’s Best survey. The Beau Rivage Resort & Casino in Biloxi was voted Mississippi’s best hotel with a score of 84.40. It’s a massive resort, with 1,740 rooms and suites, ten restaurants, four lounges and bars, twelve shops, a spa, pool, and convention center, not to mention the casino. Smack dab in the heart of St. Louis, the Hyatt Regency St. Louis at the Arch took the title of Missouri’s best hotel with a score of 82.783. Some of the 910 rooms have views of the Arch and the Mississippi River; others have views of downtown. The pet-friendly hotel has plenty of amenities, including a gym and fitness concierge, self-serve check-in kiosks, and free Wi-Fi. Dining options include Starbucks and a Ruth’s Chris Steakhouse. If you harbor fantasies of escaping to a luxury dude ranch in the mountains, Triple Creek Ranch in rural Montana is the place to go. Twenty-three luxe cabins are set on 600 acres and feature hot tubs, wood-burning fireplaces, and locally woven blankets. The all-inclusive Relais & Châteaux property organizes activities ranging from hiking and horseback riding to helicopter tours. The hotel scored 97.333 on T+L’s World’s Best survey, with readers praising its personalized service, wonderful amenities, world-class activities, and exceptional attention to details. Though Nebraska lacked a World’s Best-winning hotel, the Nebraska Tourism Commission nominated the Magnolia Hotel in Omaha, which occupies a historic building close to the city’s major sites. Constructed in 1923, the architecture was inspired by Florence’s Bargello, with marble floors, a limestone façade, and cherry wood lobby. Rooms are comfortable and nightly cookies and milk provides a nice perk. With a score of 94.727, the Ritz-Carlton New York, Central Park was voted not only the best hotel in the state of New York, but also the best hotel in the continental U.S. Often touted for its superb service, the hotel boasts a multi-lingual staff and an award-winning concierge team that can fulfill even the wildest requests. Indeed, one T+L reader commented, “the GM is fantastic and has an incredible eye for detail and hospitality.” Anyone can dine at the Auden bistro and enjoy afternoon tea, but guests get the added perk of access the Ritz-Carlton club lounge. One of those grand New England resorts that date back to the 1800s, Wentworth by the Sea was taken over and restored to its former glory by Marriott. Its coastal location near Portsmouth makes it an easy getaway from Boston. Some rooms have balconies and many have views of the ocean or the harbor. Two restaurants serve local seafood and on weekends, Salt Kitchen & Bar has a build-your-own Bloody Mary and Mimosa bar. It scored 90.933 in our World’s Best survey. The Four Seasons Hotel Las Vegas was the city’s first hotel without a casino attached, and T+L readers took note. It received a score of 91.040, and one reader called it “a nice oasis from the din of Vegas when you need a vacation from the vacation.” Another reader commented that it’s great for business travelers. Guests can expect all the usual Four Seasons touches—elegantly decorated rooms with marble baths, attentive service, and great dining options. A newcomer to the World’s Best list, the 21c Museum Hotel in Cincinnati scored 90.4. The art-focused property is credited with revitalizing the city’s historic center. A top-to-bottom renovation by the husband-and-wife team behind the 21c Museum Hotel Louisville turned the once neglected century-old building into a chic, eclectic hotel with rotating art exhibits. Originally a boarding house known for its hospitable owners, the Old Edwards Inn & Spa honors its legacy while ensuring its quality. The Relais & Châteaux property in the Blue Ridge Mountains welcomes guests with champagne before they check in to one of the plush rooms. A major renovation added pools, shops, a restaurant, and upgraded the accommodations. The property scored 91.259 in T+L’s World’s Best survey. Originally built in downtown Fargo in 1893, the Hotel Donaldson suffered a period of decline in the 1960s and ‘70s, when it became a workingman’s hotel offering daily and weekly rates. Though it didn’t appear on the World’s Best List, the North Dakota Tourism Division nominated it as the state’s best hotel. In 2003, entrepreneur Karen Stocker bought the hotel and gut-renovated it, filling the 17 rooms with bespoke art by local artists, adding the award-winning HoDo restaurant, a lounge, and a rooftop hot tub. Little touches, like a wine and cheese hour, truffle turndown service, and complimentary pastry baskets delivered to the suites, make a stay at the hotel extra special. You might think Oregon’s best hotel would be in Portland, but T+L readers voted the Allison Inn & Spa the state’s top hotel, with a score of 95.250. The sprawling eco-friendly property, situated in the idyllic Willamette Valley wine country, is home to seven acres of grapevines, fields, and gardens. The property certainly makes use of the land’s bounty—the Jory restaurant serves farm-to-table dishes and offers forty wines by the glass. The spa even uses local berries, roses, wine, and honey in its treatments. If all that wasn’t enough, the luxurious inn is LEED-gold certified. Though there were no Oklahoma hotels represented in the World’s Best Awards, the state has several fine options. The best of the bunch is the Mayo Hotel, as nominated by the Oklahoma Tourism and Recreation Department. The hotel was the tallest building in Tulsa when it was constructed in 1925 and Babe Ruth, Lucille Ball, and John F. Kennedy were all guests during its heyday. Though it fell into disrepair in the ‘80s and remained vacant for decades, it was reborn in 2009 following a $42 million renovation. Today guests will find stylish, modern rooms and suites, a restaurant, and a rooftop bar. New England is famed for its charming, historic inns, and the Chanler at Cliff Walk provides the perfect base from which to explore the famed mansions of Newport. The property scored an impressive 95.50 on T+L World’s Best survey and received rave reviews from readers, who praised the friendly staff, fantastic service, and excellent restaurant. The luxurious hotel has a rich history—it was built in 1873 as the summer home of New York congressman John Winthrop Chanler—and retains its classic ambiance, with twenty individually designed rooms. 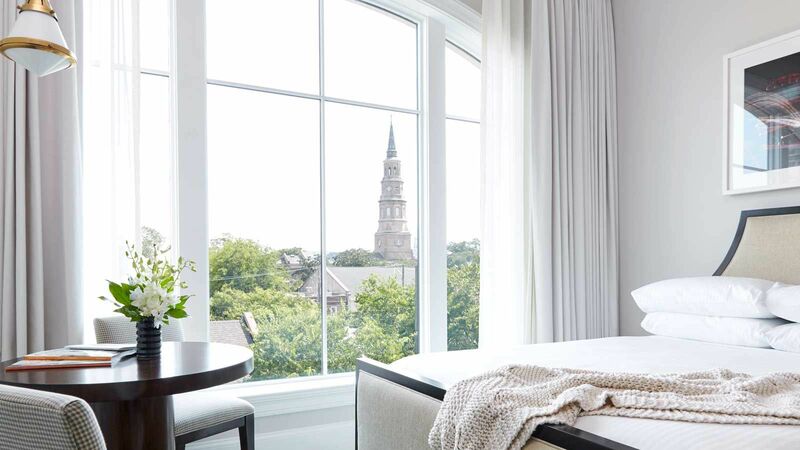 There was fierce competition for the best hotel in South Carolina, as five hotels in Charleston won World’s Best Awards this year. The Inn at Palmetto Bluff, a Montage Resort beat them out with a score of 95.636. The plantation-style resort comprises a collection of fifty cottages with cushy residential touches, like fireplaces and verandas with views of the wetlands. Guests can join naturalists on alligator hunts, go fly-fishing, golf, and indulge in spa treatments. The stately Rosewood Mansion on Turtle Creek offers the refined comforts of a home, which it once was. The oil heiress Caroline Rose Hunt transformed the 1925 mansion into a boutique hotel in 1980, and it underwent a major renovation for its 30th anniversary. Some of the 143 rooms and suites have balconies, while others have a private bar. At the Mansion restaurant, guests might rub elbows with celebrities, socialites, or former presidents. Moreover, as one T+L survey respondent commented, “What made the place special was the phenomenal service.” The hotel scored 89.455 in our World’s Best Awards. South Dakota didn’t have any hotels on the World’s Best list, but the Hotel by Gold Dust stands out as the state’s best property, as nominated by the South Dakota Department of Tourism. It’s also one of the newest, after a major renovation in 2014 turned the formerly abandoned building into a boutique hotel with amenities like free Wi-Fi, sleep number beds, and rainfall showers. The hotel is affiliated with the Gold Dust Casino and the Mavericks Steak & Cocktails restaurant. This Norwegian-inspired ski chalet received rave reviews from T+L readers and earned a score of 93.280. Stein Ericksen Lodge is renowned for its unparalleled service—a reader called it “a great place to leave it all behind, be spoiled, and truly feel like you are being pampered.” The ski resort in Utah’s Deer Valley benefits from its excellent location and invites guests to enjoy the winter wonderland, then come inside and savor mulled wine by the fire. T+L readers voted the Stowe Mountain Lodge the best in Vermont with a score of 82.737 and praised its “superb location and beautiful grounds.” The property upped the ante on the quality of resorts in this traditional New England ski destination with modern design (floor-to-ceiling windows, private balconies, stainless steel kitchen appliances in the suites), an excellent restaurant serving locally sourced food, and a 21,000 square-foot-spa. Guests can request a ride into town in the hotel’s fleet of Mercedes. 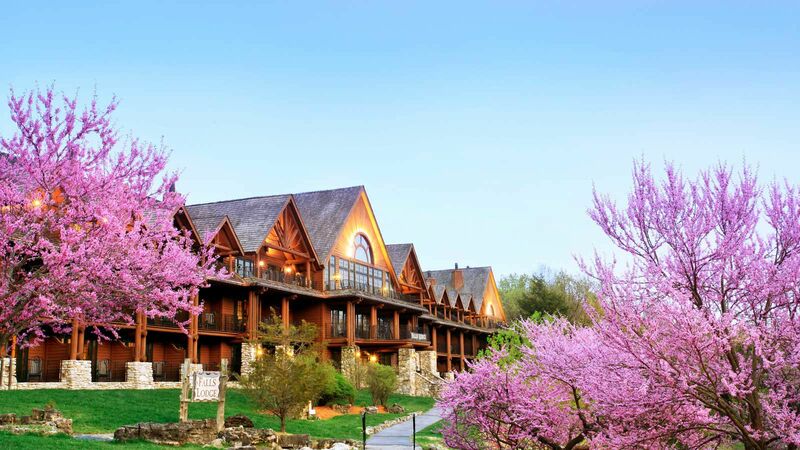 To be surrounded by nature and wildlife including black bears, eagles, deer, and bobcats, book a room at the Lodge and Cottages at Primland. T+L readers voted it the best hotel in Virginia with a score of 95.059. Three cottages spread out over 12,000 acres in the Blue Ridge Mountains set the scene for an outdoorsy adventure. Guests can stargaze in the on-site observatory, go fly-fishing, ride horses, and tee off at the property’s 18-hole golf course. Dining options range from the casual Stable Saloon to the Chef’s Table, which serves a 9-course tasting menu. Thanks in part to a prime downtown location near Pike Place Market and sweeping views of the Olympic Mountains and Elliott Bay, the Four Seasons Hotel Seattle bested Washington’s other hotels with a score of 92.842. In June, the luxury hotel opened the Goldfinch Tavern, which serves cuisine highlighting the bounty of the Pacific Northwest, especially fresh seafood. Some might find the chintzy floral patterns on the wallpaper and upholstery a bit dated, but it’s part of what makes the Greenbrier so unique. The antebellum hotel dates back to 1778 and was redesigned by Dorothy Draper—known for those distinctive floral patterns—after WWII. The area’s mineral springs drew the Rockefellers and Bing Crosby to this rural resort in the Allegheny Mountains. A $65 million renovation brought the property up-to-date, though one T+L reader affirmed, “the sense of history is still palpable.” The hotel scored 87.760 in our World’s Best Awards. The Tudor-style brick building once housed a dormitory for immigrant employees, though the accommodations at the American Club at Destination Kohler are decidedly more luxurious now. Wood paneling and rich fabrics create an old-school ambiance, and bathrooms feature Kohler fixtures. 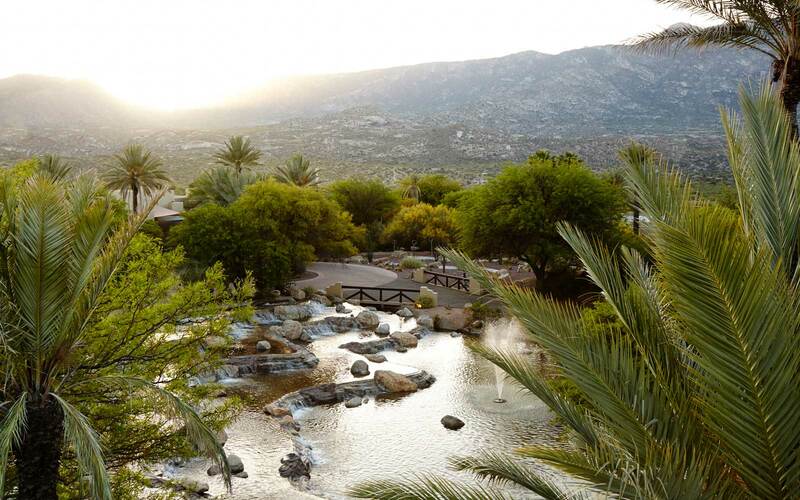 The hotel scored 90.286 in our World’s Best survey and several readers recommended the spa. Amid Jackson Hole’s many ski resorts, Hotel Terra stands out thanks to its dedication to eco-friendliness combined with world-class amenities. The LEED-silver certified property has everything from 100 percent organic linens and spa products to recycling bins stored in room closets. Design touches include reclaimed wood tables and paintings by local artists. In addition to access to the slopes, guests love to indulge in the infinity pool, rooftop hot tub, and spa. The hotel scored 88.222 in T+L’s World’s Best Awards. 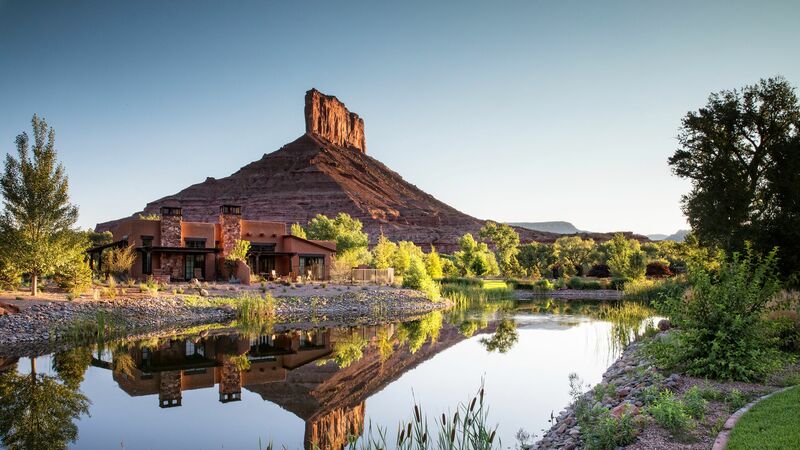 The elegant Rosewood Inn of the Anasazi takes its design cues from the Southwestern landscape and traditional pueblo aesthetic, and updates it with modern amenities. 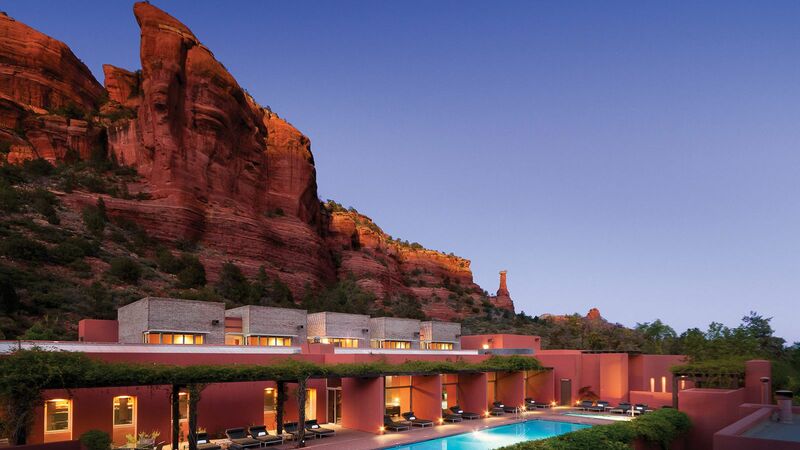 All 58 rooms have earthy sandstone walls, custom beds, and kiva fireplaces. The luxury boutique hotel scored 89.684 in T+L’s World’s Best Awards survey, with one guest noting that it has “the best location in Santa Fe.” No wonder celebs and sophisticated travelers choose it as the place to stay.